Even in the Outer Rim, there are those who have a keen respect for knowledge and learning. Having someone around who actually knows something more than how to reload a heavy blaster can be exceedingly useful, especially when facing something truly unknown. 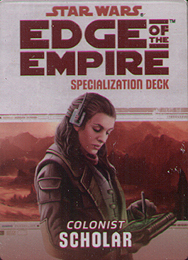 This deck requires the Edge of the Empire Core Rulebook and includes cards for all 20 talents available in the Scholar specialization.